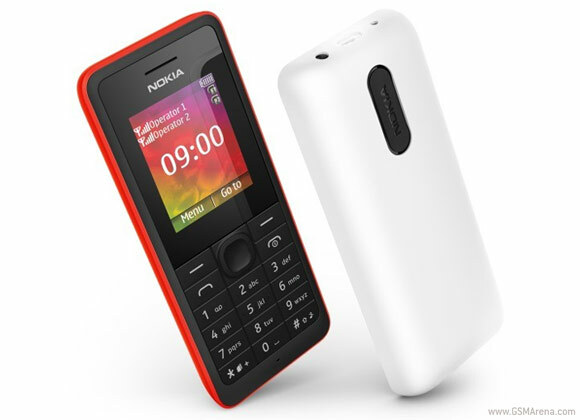 Nokia has just unveiled two new featurephones - the Nokia 106 and Nokia 107 Dual SIM. The former features quad-band GSM network support, while the latter is dual-band for both SIM cards. Both are built around a 1.8" 65k-color TFT display and run the Series 30 platform. The similarities between the two phones continue in the design department. They both measure 112.9mm x 47.5mm x 14.9 mm and sport dust- and spill- resistant keyboards as well as FM radio receivers and a LED flashlights. The Nokia 107 Dual SIM weighs a tad more at 75.8 grams because of its larger 1020 mAh battery, which allows it to survive 36 days of stand-by. The Nokia 106 packs an 800mAh battery but comes pretty close with a rated stand-by time of 35 days. Its weight isn't too much off either at 74.2 grams. On top of that, the Nokia 107 Dual SIM features an microSD card slot that supports cards of up to 16GB. Nokia says customers can save up to 3,000 songs on it and enjoy music playback endurance of 34.8 hours. As you've already guessed the main attraction of the Nokia 106 and Nokia 107 Dual SIM is the pricing. Since the Nokia 107 boasts a larger battery and microSD card slot, it's priced at $25, while the Nokia 106 will retail for $23 (excluding taxes and subsidies). Nokia is launching both phones in Q3 of this year (which runs until September) in China with no word on international availability just yet. When will be launched the nokia 107 dual sim?? Pls rply me!!! !